It's that time of year--Christmas is over and a shiny new year is only days away. But before I start setting goals and intentions for 2017, I want to reflect back on the last year. My word for this year was create, and I have to admit that it was mostly a fail. I did have a good stretch of writing in July and August, and launching the podcast was a success--though something I had not planned on doing at all when I chose the word create--but I did not make time for the other pursuits I intended to like hand-lettering, playing piano, and collaging. I think the problem was one of priorities: I wanted to create, but not more than I wanted to go to sleep or read a good book. Sleep is much improved in our house, but still in limited supply. I start parenting in the 5 o'clock hour, so by the evenings I am ready to read, watch a show, or hang out with Neil. My best creative work happens in the morning and that is not time I have available for my own pursuits at this stage in our lives. I had listed those same problems in my original post and was overly optimistic about my desire to work during the blocks of time I did have available. I am going to try and be more honest with myself as I set my goals for 2017 so I don't have to rehash the same shortcomings this time next year. I may not have done everything I wanted to, but I am happy with what I accomplished under the circumstances. We bought a house and moved. Finding, buying, and moving into our house consumed much of my time, energy, and thoughts for the first third of the year. We are now in a house with no move in sight, which feels strange, but in a good way. We started going to and then joined a church. Being part of a church community again has been a highlight of the year for me. Being connected to the ritual of church, the support of a community, and a place where social justice is a central aim has steadied me, particularly in the days and weeks since the election. Abby and I launched a podcast! We started discussing this idea in the early summer and uploaded our first episode in November. It has been such fun to work on a creative project together and to share it with the world. Settled. It was our first full year in Indiana. Our family is settled in the house, HP is settled at preschool, and Neil is settled at his job. We have now been in Bloomington for a year and a half. Things feel less new and more routine, but not in a boring kind of way, in a feels like home kind of way. Easier. Parenting two kids is not easy, but it is getting easier all the time. HP and E can play together and entertain each other in a way that was only a dream last January. E is down to one (or no) nap, which simplifies just about every aspect of our days. Content. I have been feeling at ease with where we are--the amount of stuff in our home, the number of activities in our lives, and the relationships we are building here in town. Life is not perfect, but it is ours and it is good. Christmas is almost upon us. This year, even more than years past, I am so looking forward to its arrival. The season has felt particularly magical this time around. HP really gets it this year, in the best possible way. There is also something special about the fact that this is the first year we will be celebrating in the home we hope to be in for many years to come. I get a huge smile on my face just thinking about how much delight there will be on Christmas morning. Evening walks. Neil has been taking the kids on a walk to see Christmas lights most nights after dinner. Sometimes it is only up and down our block, sometimes they go farther afield. The kids love the novelty of being outside while it is dark; it is the perfect activity to end the day. Answers to "what's Santa going to bring you?" HP: a drum, a plant, and a candy can (not misspelled, that's what he says). E: "Christmas!" Food traditions, new and old, including Chex mix, cheese ball, enchiladas, egg and sausage breakfast casserole, and starting this year, my great-grandmother's cinnamon roll recipe. There are so many things to love this time of year, but delicious and nostalgic food ranks high up there for me. Going to a play with Neil. We saw a local production of Oliver! We hadn't been out together in what felt like ages. I would love to make seeing a play or musical performance something we do every year in the week leading up to Christmas. Playing Santa. HP determines who is the kid, the parent, and the Santa. "Santa" wraps gifts in cloth napkins and puts them under the tree at which point the kid wakes up and gets to open them. This process brings an astonishing about of joy and entertainment to HP. E enjoys it, too, when she isn't upset about things she wants to play with being wrapped up. Neil likes being the kid as that means he gets to pretend to sleep on the couch while the present wrapping is happening. Something for everyone! Reading all the Christmas stories. We have many favorites, but HP especially loves the ones by Jan Brett. And for some reason both kids are drawn to Fancy Nancy and Maisy books. Starting the weekend after Christmas we have been reading Christmas books all day every day. Being part of a church community. We started regularly going to church this summer and joined earlier this month. I so love the ritual and community church provides. It is important to us that our kids have a place to explore their beliefs and the beliefs of others and--most importantly--put those beliefs into action through the social justice work of the church. (Bonus: the music is phenomenal.) Finding church can be a challenging prospect and I am thankful to have found a good fit for our family. On a related note: children's Christmas pageant tomorrow. Excited doesn't even begin to describe. Limiting gifts. Neil and I aren't exchanging gifts and we are keeping it simple for the kids, which leaves more time to just be and less time spent shopping and/or thinking about shopping. A win all around. Wishing you all a holiday that is merry, warm, and bright. On Friday it was seventy degrees. On Saturday there was freezing rain or our ride to the market. We had a good run with an unusually warm fall, but there is no denying it--the cold has officially arrived. It is easy to bemoan winter and all of the challenges it brings, especially when dealing with young children confined inside. We essentially live outdoors during the spring, summer, and fall. Winter is a different beast. This year I am trying to embrace the concept of living seasonally and focus my energy on the positive aspects of winter. It is a time to turn inward, slow down, and spend more time with family. As I write this I am awake before the rest of the house, curled up in a blanket, watching the fire with my hot cup of coffee. Perfection. The holidays. HP and I are already discussing Christmas--baking cookies, what presents he would like (a drum), what E might like (a plant for their room), and gifts for other family members (leaves). Neil and I have tickets to see Oliver and my book club has planned a holiday gathering and book exchange. December is already feeling full, but in a good way. Warm drinks by the fire. A frequent repeat of this morning would be welcome. Watching HP play in the snow. Last year he couldn't go out nearly as much as he liked because we lived on a busy street with no fence. E did not like the cold and was often napping when he wanted to go out. This year, he'll have free rein to go out as often as he likes, even if the rest of us want to stay inside. Both kids are old enough to enjoy sledding at the park or down the hill in our front yard. HP is already discussing his snowman building and driveway clearing plans and this will be the first year E can join in the fun. Playing games after the kids are in bed. Neil and I bought Quixx on our trip to Missouri this month and it has renewed our desire to play games together. Neil's family will be in town for Thanksgiving this week and I am sure we'll play at least a few rounds of cards. I would love to some other folks in town who would be interested in a semi-regular game night. All the hot soups. So easy to make, so satisfying to eat. Good books. I read all year, but something about winter makes me want to dive in more than usual. On deck at the moment: A Little Life, The Underground Railroad, and The High Mountains of Portugal. The new year. A fresh start, time to make goals, what's not to love? I especially appreciate the blank slate after the rush of the holidays. *A new episode of Friendlier is up today--all about food. I would love for you to give it a listen! Friends, I have exciting news to share. My good friend from college, Abby, and I have started a podcast--Friendlier. In each episode we will catch up on life lately, chat about what we're reading, what we're eating, and delve into a topic for the day. In our pilot episode we discuss our college experiences. We will be releasing episodes every other Tuesday, starting this week. So if you need a break from election coverage, we've got you covered. We would love for you to check out Friendlier and let us know what you think. You can listen through iTunes or Stitcher, or by going to our website. It is both exciting, nerve-racking, and energizing to embark on this new creative venture. Wearing sweaters. Fall is here, and it is glorious. Cool breezes that require jeans and jackets, cloudy bike rides to preschool with a chill in the air, soups every night--I love it all. Thinking about Smarter, Faster, Better by Charles Duhigg. So many excellent insights into productivity. The one that has stuck with me the most is having mental models of how your day/week should go to both keep you focused and allow you to easily recognize when something is amiss. Thrilled to be in a book club again. Lab Girl by Hope Jahren is our first book and I am almost done. It took me about a hundred pages to get into it, but once I did I couldn't stop. It has confirmed what I already knew: I would be a terrible bench scientist, but it is fascinating to have an inside look into that world. One woman in our book club runs a lab at IU so I am particularly interested in hearing her take. Listening to Harry Potter and the Sacred Text. It takes me back to my undergraduate days as a religion major in the best kind of way and inspired me to pick up the first book in the series for a reread. All the warm feelings for this podcast. Hoping to take another bike camping trip during the height of the fall colors. Fingers crossed the weather works in our favor so we can make it happen. Last year the boys when bike camping around this time and the temperature dropped below freezing the night of the trip, which made me glad E and I stayed home. Loving our new bike racks! Neil finished installing three racks this weekend. It is so nice to have specific place for all of our bikes that is protected from the weather instead of haphazardly locking them to the edge of the carport or storing them in the shed/workroom. One more project to crossed off the list! Excited to celebrate E's birthday. Two! She may not know exactly what a birthday is, but her brother does and his excitement is contagious. I have no doubt she'll enjoy the cake, ice cream, and presents even if she doesn't fully understand the occasion. We are having a small family celebration because, well, that's what we prefer. 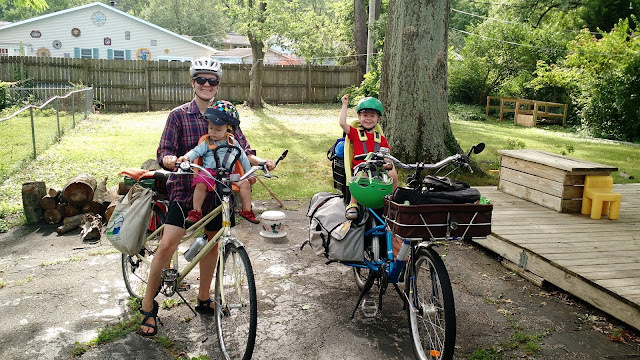 The Yuba was our first cargo bike purchase. It is a longtail bike, which means the section in the back where you normally put a rack is longer, hence the name. It has a wooden platform over the rack that is about twice as long as a traditional rack. This is Neil's preferred cargo bike. He likes it because it rides so much like a regular bike, but with more capacity. I use this bike if I am going grocery shopping by myself, but do not regularly ride it with the kids. Right now it is setup as pictured above with a seat on the back for HP and a seat on the front for E. We just ordered a set of monkey bars and a soft spot so HP can ride sitting on the back once he outgrows the seat. Then E will switch to the back seat when she outgrows the one in front. On our anniversary last year Neil gave me a ride to the restaurant on this bike, because why not? It comes in handy to pick people up / drop them off at the bus station instead of having to walk or leave a bike locked up in public for days at a time. It is also good for towing other bikes (front wheel of bike being towed goes into the pannier and back wheel rolls on the ground). We bought our cargo bike last fall with the intention of finding something that could work through the winter. We pre-ordered the soft-top, but it only just arrived last month. Now we have a covered option to keep the kids protected from the elements. We considered getting a bakfiets, but went with the Madsen as it was more affordable, easier to ride out of the box, and has a larger capacity. It can seat four kids--two on each bench. I prefer this bike for the kids over the Yuba and ride it almost every day. Neil (6'1'') finds it slightly awkward as he is at the top of the height range, but he has admitted that it would probably be fine if he spent a little more time making adjustments. We are a bit of a spectacle riding around town in this, but we have a lot of fun. The kids like sitting next to each other and they are up high enough to see everything around them. The main downside is its speed: it is slow--very, very slow. I am used to it and just consider it part of my exercise regimen, but I am always shocked at how much faster I can ride when I am traveling on Electra (see below) without kids. Neil bought this commuter bike in Austin after he ran his road bike into the ground. The link above is to the newer version of what he has. This is the bike he takes to work every day and uses when he is traveling alone. Neil scored this bike at a neighborhood clean-up "free" section. He wanted a second bike that he could ride in the winter when there is salt on the roads to help keep his Fairdale better condition. He just got it this spring, so no report yet on how to performs. I bought this bike in 2013, specifically because it worked well with the Yepp Mini seat. (You can read more about why I love the Yepp Mini here.) The geometry of American bikes is surprisingly ill-suited to front seats, and it was a challenge to find one where my knees did not hit the seat when I pedaled. It is a basic commuter bike. I used to have a road bike, but I sold it back in Austin when I realized that I like riding in an upright position. For me, comfort wins over speed any day. I bought this bike from a garage sale this spring to have as a spare bike. I definitely don't need this one, but it's nice to have another bike in a smaller size for when guests come to visit. Bonus: we got it for a steal of a price. We got this for HP on his second birthday. For the first year and a half he had it he was supremely uninterested in riding it. Instead, he liked to wheel it around the yard and park it various places. Early this spring something clicked and he wanted to ride it to the park and all over the neighborhood. Two months later, he graduated to a pedal bike (see below). Neil bought this bike off of Craigslist last summer. Switching from the Strider to the pedal bike was a relatively seamless process. Mastering the Strider taught him how to steer and balance, so all he had to do was add pedaling. Bonus: we became friends with the people who sold us this bike and Neil and HP went bike camping with them in the fall. Love, love, love using this seat. HP used this seat until he outgrew it at 2.5. I cannot recommend having the child in the front enough, whether it is this one or a different brand. We switched to this seat when HP outgrew the Mini. I do not like riding with him in this seat on my Electra as I find it too unstable with his weight so high over the rack. We primarily use this seat on the Yuba, where stability is not an issue. Now that we have the Madsen, I almost never use this seat. Neil will use it when he picks up HP from preschool or when they go on an errand together. Some friends rehabed this bike trailer for us when HP was born. We used it for groceries every week for almost two years until we got the Yuba. HP rode in it if it was raining or cold when we were in Austin. Since we didn't have the cover for the Madsen this past winter, the kids rode in the trailer regularly in the cold temps. Personally, I do not love using a trailer. I find it more physically taxing to ride pulling the weight rather than having it integrated into the frame, the kids can't see out as well, and I can't talk to them or hear them as easily. That said, it is a great option if you are looking to get into riding with your kids. There are so many used ones available on Craigslist that there is a low cost of entry to start cycling as a family. No real purpose other than leisure, but wouldn't it be fun? We could take it as a carry-on when we travel then ride out of the airport! Though then Neil and I would both need one and we'd have to traveling without the kids. It is unlikely to be worth the cost to us anytime soon, but fun to dream about. I know we have two cargo bikes, but neither one is great at hauling things like lumber, a canoe, or appliances. If we had this, there is nothing we couldn't move by bike! Maybe Neil and I will splurge on this as a Christmas present to ourselves this year. Our system is ever-evolving, but for now, these are the bikes that make car-free living both possible and fun. Before we moved to Bloomington, every place we lived had an end-date. We may not have known exactly when it was, but we knew we weren't committed for the long haul. Even when I tried not to let it, that knowledge led to a one-foot-in, one-foot-out mentality. For the first time, I don't feel that way; ten years from now, we fully expect to still be here. I recently finished reading Melody Warnick's book This is Where You Belong and loved it. I was already feeling positive about our decision to move to Bloomington, but reading the book further solidified my love for this town. The premise of the book is that there are things we can do to make ourselves more "place-attached" to where we live. I am a firm believer that I can be happy anywhere, though I do think certain environments are more conducive to happiness than others. One of the main reasons we left Austin is that it felt too big; we knew that a smaller town would be a better fit for our family. The book inspired me to take direct actions to facilitate putting down roots. I subscribed to the local paper, bought season tickets to a local theater company, and turned in a request to the City to fix an intersection that does not detect cyclists. One of the questions she asks herself throughout the book is "What would someone who loves (insert the name of your town here) do?" I have been asking myself the same question with great results like introducing myself to people at the farmers' market stands we frequent, stopping in and say hello to the folks at the Bloomington Bike Project, and supporting a local bike shop instead of purchasing something online. As things start to get easier I can see that in the not-too-distant future I will have even more time and bandwidth to serve on boards, volunteer, and generally be involved in the community. Warnick's book encourages readers to change where they live for the better, but perhaps more importantly, to change the way they think about where they live. When I picked it up I expected it to be a fluffy, light read. I was pleasantly surprised to find that it is one of those books that I will be thinking about for years to come. Fenced in backyard for the win. Neil and I have moved a lot: eight times in eight years, nine if you count a one-month AirBnB rental as we transitioned from Austin to Bloomington. Once we sold our house in Austin, we started to seriously look for homes for sale here with the hope that it would be our last move for a long time. The location was the limiting factor in our search. There was a very small area of town that met our requirements for ease of walking and biking. We were willing to compromise on many aspects of the house itself, but not on location. We saw the house we ended up buying the day after it went on the market. It was in a great location, but at the very top of our price range. When we got home from seeing it both Neil and I agreed that we could see ourselves there, but that it wasn't perfect. We decided to walk away, thinking that it was still early in the search and that we would find something we liked better that cost less. A month later, the price dropped significantly, which made the house much more interesting to us. We saw it again, this time with my sister and her husband who were in town visiting. Just like the first time, we were on the fence. There were parts of it we loved, and parts we did not. The next day we decided to put in an offer for $10k below the asking price, then negotiated it down even further after the inspection. Now, three months after moving, it feels like home. And our biggest complaint: at just over 1500 sqft it feels too big. We are using the second living space, but would have happily lived in the house without the addition. It is more to clean, more to maintain, more to heat and cool...the list goes on. That said, I know it will make things easier as the kids grow and want to have a space to hang out with their friends. Even now, we've been enjoying having separate "adult" and "kid" living spaces. So I suppose the extra space is both a pro and a con. I both loved and hated the home buying process. It was fun at first, but as it dragged on the stress started to overwhelm me. Looking back I think, Why was that so stressful? But I know it was, and I am glad it is behind us. There is a lot of talk out in the world about finding the perfect house and how you'll just know when you find the right one. We never had that feeling with this house (or with our house in Austin, for that matter). We are happy we bought it and it works for our family, but there was never some magical feeling that this was the one. At times during the process that lack of certitude made me question our decision, but now I think it was for the best. Buying a house is a major financial transaction; it's okay that we let our practical side guide us. Is this our forever house? Possibly. We bought it thinking this would be the house the kids grew up in, but that once HP moved out we would downsize to a two-bedroom. If the City changes its code--which they are looking into--we may be able to build a tiny house in the backyard that Neil and I could live in as empty-nesters. We could AirBnB the tiny house and/or use it for guests if we built it before the kids moved out. But that is a project for another day; for now, we are relishing the fact that there is no move in sight. Needing new rain gear. I rode to church in a downpour last Sunday and arrived completely soaked. So soaked, that I had to go into the bathroom, wring my shirt out, and put it back on. I bought my raincoat and rain pants before we moved to Oregon in 2008 and they seem to have lost all of their water repelling abilities over the years. Excited that the school year has started! We had a great summer, but I am more ready for the routine of preschool. First day was on Monday; all smiles at pick-up! Trying to spend less on groceries this month. What can I say? We love to eat nuts and good cheese. We'll see how we do. Thankful that my mom is visiting while Neil is in California at a conference. Refreshed from my weekend in Chicago. Having forty-eight kid-free hours to explore a new city with old friends was just what I needed to fill my tank. See also: delicious ramen, sushi, and pizza. Wanting to find at least one play and concert to attend this fall. Planning more ways for our family to explore nature in the area. Perhaps a bike-ride one Saturday to a nearby lake? Joining a newly-formed book club next month. I so loved my book club in Austin and have been wanting to find one here. Now I have! Listening to Harvey sing the state song over and over. And over. He especially likes to sing it in the back of the bucket bike. There has been a shift in our family this summer; things are feeling easier. Not exactly easy, but easier. Long road trips are surprisingly smooth We can go on outdoor adventures that would have been more stress than fun just a few months ago. Getting out the door is not quite the ordeal it used to be. The end of diapers is not here, but it is in sight. HP has largely moved past tantrums and shows great self-control. A recent trip to the farmers' market and grocery store highlighted how different life is now compared to last year. I took both kids there by myself while Neil stayed home to work on a house project. Partway there I realized that I forgot the carrier E uses at the market. Not long ago, I would have turned around to retrieve it. Instead, I shrugged my shoulders and kept going. Amazingly, it didn't feel daunting to walk through a busy market holding our bags with both kids walking beside me. A trip like that used to be a feat. Now it is everyday life--not much more stressful or time-consuming than going on my own. I noticed this newfound ease again on our trips to visit family this summer. I was continually impressed with how well the kids did with new faces, new places, and very little sleep. (Why? Why can no one sleep on vacation?!) In Virginia there were several moments when I thought, "If this same situation had happened six months ago HP would not be okay." But now, he can roll with it. Or if he can't, he can articulate the problem to us in a (relatively) reasoned way. Please don't misunderstand: there were many, many hard moments on both trips as it is a lot of work to travel with two young children. But it is less work now than this time last year, and this time next year it will be even easier. I love to see and cuddle my friends' infants (I'm looking at you, Plum), but I am happy to be entering new territory as a family. We are still in the "families with young children" stage, but now they are "ever-so-slightly-more-independent children." The difference between that and life with a child under the age of one cannot be overstated. 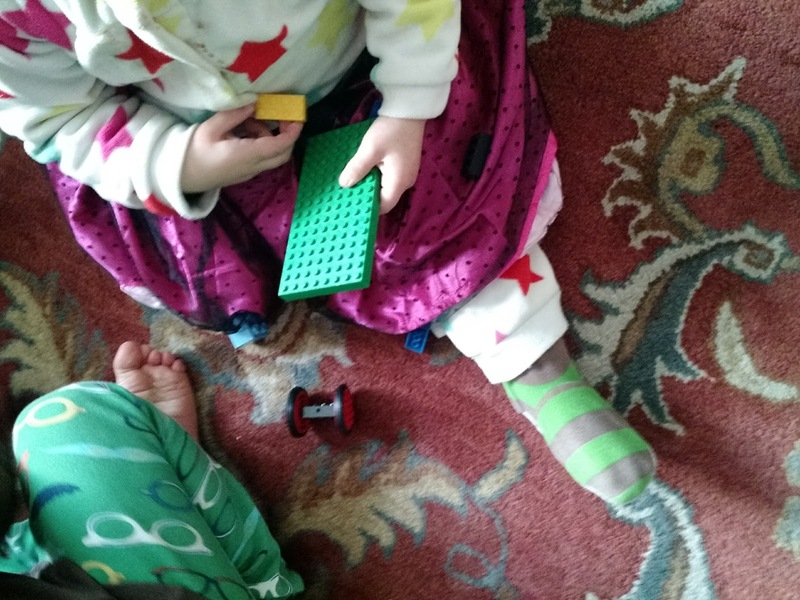 A month after HP turned one, I wrote about entering toddlerhood. Passing the 18 month mark with E elicits those same feelings--excitement for the future coupled with appreciation for the moment we're in. I can't say it better than I said it then: It no longer feels like we're struggling to keep our heads above water; we're able to enjoy the swim. I love the start of a new month. It feels especially refreshing to start a new month on a Monday. I am heading into August riding a wave of productivity. These last few weeks I have accomplished more than usual. I think the reasons are threefold (1) I am getting more sleep, which is key to all the things, (2) life is settling into an easier rhythm with the kids as they get older, and (3) I am utilizing smaller bits of time that I used to fritter away. Natanya recently wrote about all of the things she can accomplish in ten minutes. So, so true. This month we have two trips planned--one for Neil and one for me--so we'll both get to go out of town and solo-parent. Neil is going to a work conference in Anaheim, California. I am headed to Chicago to meet-up with two high school friends. We haven't all three been together in... a decade? On the agenda: lots of Olympics watching, catching up, and good food. This will be only my second time away from E overnight. Other things happening in August: the start of preschool and end of swim lessons. The transition to a new class may be a little rough for HP. 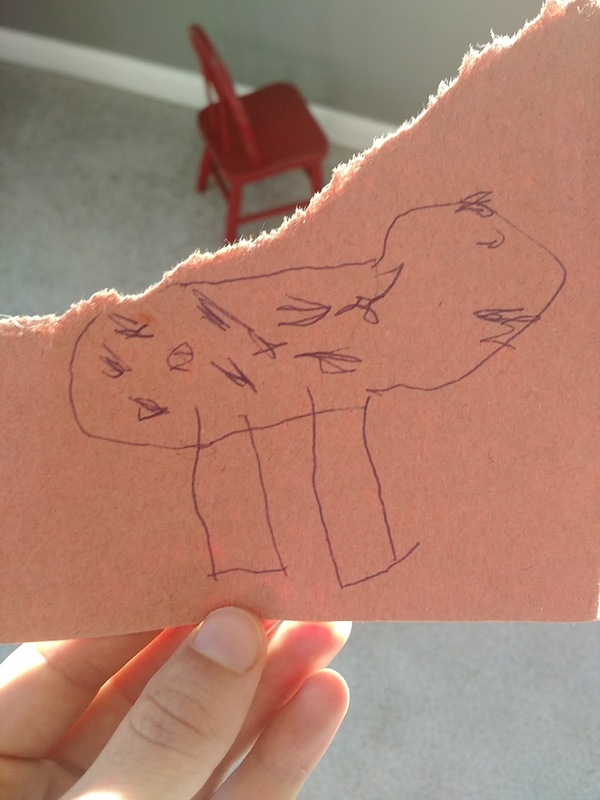 Change is hard, especially when you are four. I have no doubt he'll be loving it by the end of the first week. Continue posting twice a week here. I have gotten into a good rhythm and I want to keep up the momentum. I may struggle a bit around the trips, but I am going to do my best to keep plugging away. Take care of a health insurance issue. Calling health insurance companies is the worst. Organize photos on our external hard drive. I started doing this last week and made a lot of progress. This has been on my to-do list for YEARS. Once these are all culled and sorted, I plan to make a photo book for each kid, inspired by a recent Girl Next Door episode. Photo books won't happen this month, but just getting the hard drive organized would be huge. Find a good exercise routine. I'd like to find three or four classes to go to each week and then commit to making it happen. This will be easier once preschool starts mid-month and I have more open hours. New school year, new start. Complete house projects: hanging ceiling fans in two of the bedrooms, install a solar tube in E's room (this one might be a stretch for this month), and figure out what we are going to do with our fireplace (gas insert? wood burning insert? I need to not be cold in the winter). Get back in a reading groove. 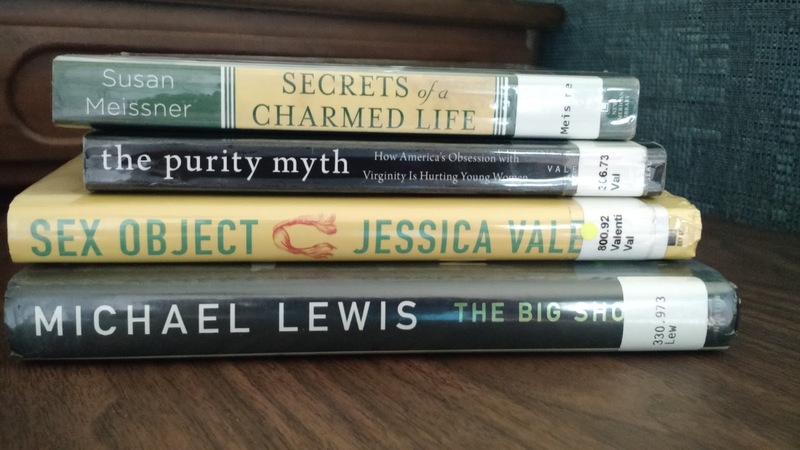 June and July have been rough for reading around here. I am currently reading The Big Short and picked up three holds from the library yesterday. Take my spare bike to the shop to get the shifter fixed as it is currently stuck in one gear. Figure out Neil's birthday present. I have an idea, but need to make a trip to Goodwill and another store to make it happen, which means I need to think about it now instead of days before. Okay, that is plenty for one month! May the momentum and productivity continue through to September. 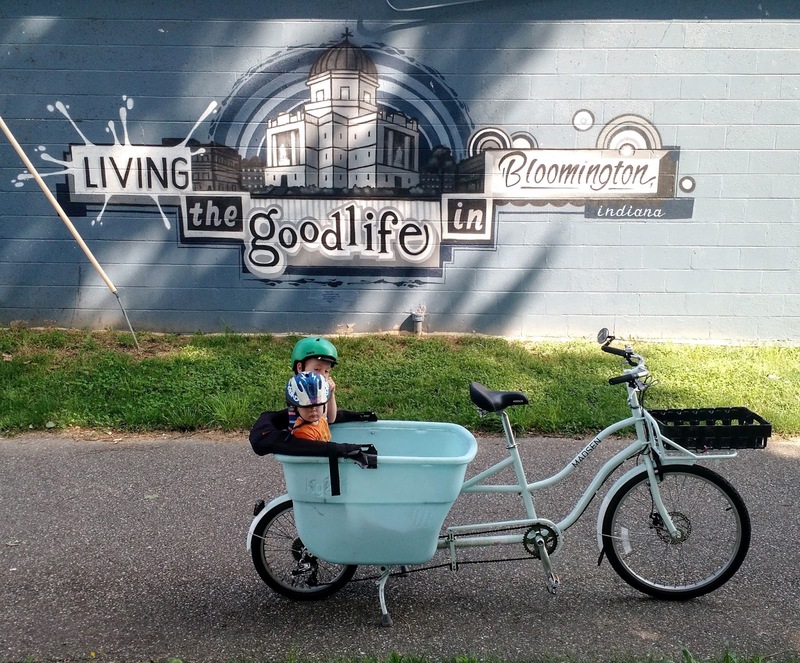 In the middle of last month we celebrated a year in Bloomington. A whole year! Physically smaller than Austin. I have a friend that lives on the east edge of town here and when I visit her it feels like it is so far, even though it is less than five miles from our house. Five miles felt close in Austin, but here I rarely have to bike more than two--a luxury I do not take for granted. Amenities of a bigger city--international food, world-class music at IU, plays, concerts, etc. Small-town feeling, but not too small. Even after only being here a year, I run into same people at the market, the library, or the Y. It doesn't feel confining, it feels like we are starting to belong. Four seasons. Seemingly endless summer, I do not miss you. 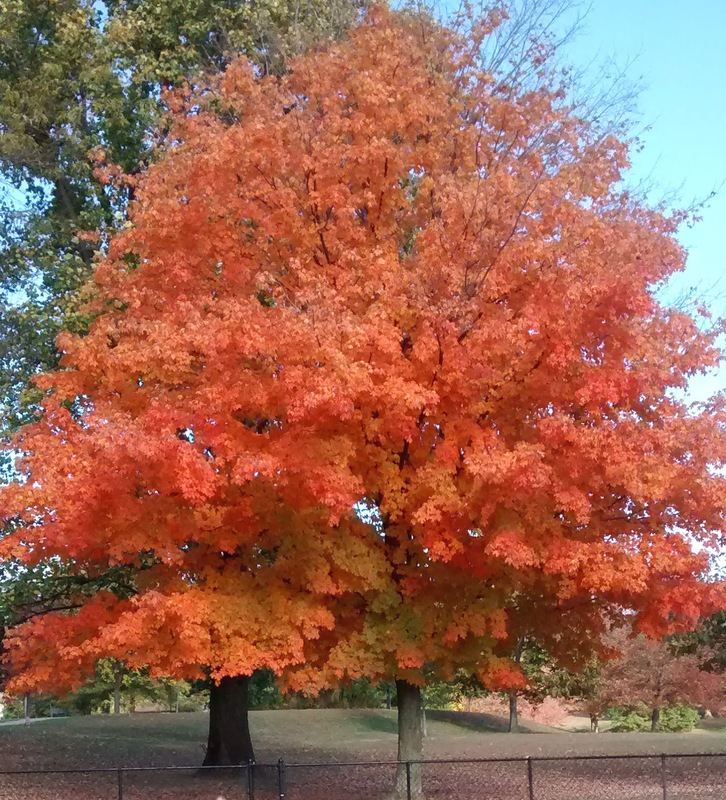 Fall here is truly spectacular to behold (see photo above for proof). I even enjoyed the winter and snow. It has been particularly fun to experience the change in seasons with HP who curious about everything happening in the natural world. Beautiful parks. There are fewer small neighborhood parks here than in Austin, but the parks they do have are large and include a lot of green space. Lucky us, we live next door to one of those parks. Strong biking community. There are paths and bike lanes, but more than that, I see individuals and families biking everywhere we go. So many cargo bikes! The only downside to Bloomington I've found so far is that it is not in the Pacific Northwest, which we love. But then again, if we lived there we would be farther from our parents and much of our extended family (though closer to my brothers). Indiana may not be Oregon, but it has its own beauty waiting for us to explore. We have moved so much in the last decade that it feels good to know that we will be here for the foreseeable future. I still get an itch to go off on a new adventure--maybe a year abroad with the kids when they are in elementary school--but am happy to grow our roots here. We can be happy anywhere. Happiness depends much more on people and relationships than it does on place. That said, I am glad we took the risk to uproot our family and try something new. Bloomington feels like home in a way that Austin never did. Even though we loved so many aspects of our lives there, it always felt like we had one foot in and one foot out. Now both feet are firmly planted in Hoosier soil. A few days ago HP asked me when were going to move out of this house and--for the first time in his life--I could tell him that we have no plans to leave. It's a good feeling. (1) It facilitates conversation. When E is up on the handlebars, we are seeing the same things. I can talk to her as I ride, and as she gets older she can talk to me about what she sees. I have many sweet memories of cruising around Austin with HP chatting about the trucks, taco joints (he remembers every place we've ever had a taco! ), trash cans, and anything else we saw en route. (2) It's easy to ride. I find I have more control and am better able to handle the bike with the weight up front rather than over the rear rack. I was worried about a steep learning curve when I started using the Yepp (and even practiced with weights in the seat before riding with HP), but it feels almost same as riding riding on my own. (3) Parking's a breeze. Maneuvering a trailer into a bike rack without blocking the sidewalk or sticking out into the parking lot is a challenge. With the front seat the bike takes up the same amount of space as when I'm riding solo. (4) It is simple to switch between bikes. This is a unique feature of the seat we use, the Yepp Mini. There is a release mechanism under the seat so we can switch the seat from my bike to Neil's with the push of the button. We each have an adapter (mine for a quill stem, his for a threadless). When we go places as a family E can ride with me there and Neil can take her home. Or if we were meeting up somewhere and then going our separate ways we could switch the seat to accommodate. My only caveat to my enthusiastic recommendation of a front-mounted seat is that it is hard to find an American bike that works well with the design. The geometry of most bikes here makes it awkward to ride with the front seat--either your chest hits the seat (and therefore pushes your child's head forward), your knees hit the seat as you pedal, or both. I ended up buying a new bike that worked well with the Yepp (an Electra Ticino). That may seem extreme, but I had been wanting an upright commuter bike to replace my mountain bike for awhile; accommodating the front seat was the final push I needed to make the switch. In the end, we bike so much that it was worth it to me to be comfortable and not make compromises on the fit. Moral of the story: if you are considering buying a front seat, I recommend bringing your bike in and trying it out to make sure it is compatible before making the purchase. Confession: We lived in Indiana for more than nine months before we hired a babysitter. We didn't prioritize it for two reasons: our homebody nature and cost. We generally like to stay home, eat the food we cook, and go to bed early. Our kids' bedtime is around seven, so that gives us a couple of kid-free hours to read, talk, play cards, or watch the latest John Oliver show. Beyond our general enjoyment for staying in, we (I) got hung up on expense. It was (is) hard for me to swallow the cost, especially when it is on top of another activity that requires money. The fact that we like staying home made it that much harder to justify financially. Sometime this spring I decided that our lack of babysitter was a problem that needed to be solved. We don't need to go out on a weekly basis, but I wanted to be able to say yes if an opportunity presented itself. We now have two sitters who can and have watched the kids. If my parents or in-laws lived in town I have no doubt we would get out more often. It would be a win-win situation: the kids and grandparents would get opportunities to develop their own relationship without us around and we would get to go out. Alas, we do not live near family, so a babysitter it is. 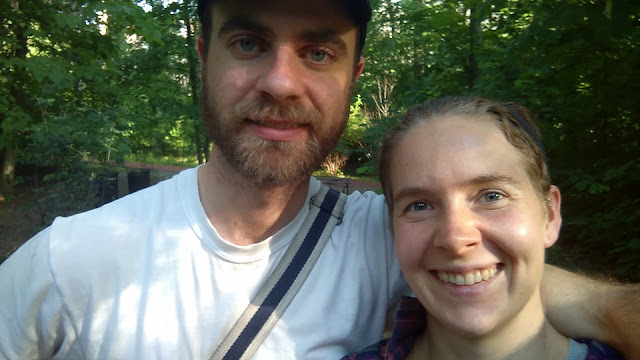 So far we've (1) gone to food truck Fridays, walked around IU's campus, and relaxed in the park by our house, (2) gone out to dinner for our anniversary, (3) met up with three other couples for dinner and a concert, and (4) walked to the park for a free concert. Now that we have sitters we are trying to go out at least once a month so the kids remain familiar with them and vice versa. When planning dates we are prioritizing unique events around town or opportunities to deepen relationship with friends. (It is so nice to socialize with other adults when everyone is not simultaneously parenting!) In the coming months I want to see another concert in the park, go to a musical, check out some of the world-class music at IU, and get together with friends to play cards. Has having regular date nights drastically changed the landscape of our marriage? Not at all. Am I glad we are doing it anyway? Yes. It may not be necessary, but every once in awhile it sure is nice to skip the bedtime routine, have an uninterrupted conversation, and come home to a quiet house. Eating all the summertime produce. There is so much variety at the farmers' market this time of year--peaches, blueberries, green beans, tomatoes, corn--that we are loading up on Saturdays in addition to picking up our full share CSA on Wednesdays. HP particularly loves the corn and cherry tomatoes. Stuck in a reading slump. This is the third year in a row that my reading has slowed waaaaaay down in June and July. It is also the third year that we have had a move in those months, which is likely not a coincidence. Recommendations of truly excellent books are welcome to get me back in the reading game. Watching swim lessons from behind a bush. HP started lessons but does much better when he can't see me. I love seeing him do something new and stretch himself out of his comfort zone. Thinking about this article and this podcast, both which I found insightful and challenging in the best kind of way. Brainstorming with Abby about starting a podcast together. Eeek! Inspired by Kelsey to make a photo book for each of my kids. I need to set a date to complete it and schedule in time to make it happen. I know both kids would love looking at pictures of themselves and hearing the accompanying stories. Closing in on minimizing all of our possessions. The milk crate of files and a few items yet to be unpacked are awaiting their fate, but otherwise feeling like we have just the right amount of stuff. Prioritizing going to the gym again, including some 6 a.m. classes. Biking and walking everywhere keeps me active, but it does not compare to a great workout class. Celebrating one year in Bloomington! I regularly think about how glad I am that this opportunity came up for Neil; it is just the place we want to be to raise our family. 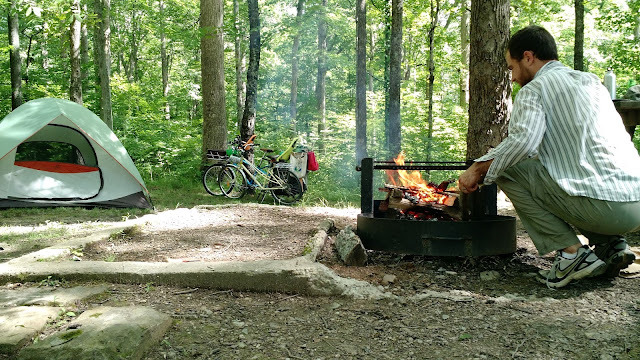 Earlier this month we went bike camping at Yellowwood State Forest. HP had been camping twice before, but it was E's very first time and therefore our first camping experience as a family of four. The ride was fifteen miles each way. I got off easy riding my commuter bike with two small panniers, the camping pads, and E on the Yepp Mini. Neil hauled the main load on our Yuba Mundo with HP in the Yepp Maxi seat. E was ready to get off the bike around mile ten, but was fine once I started doling out the cheese cubes and banana chips. Most of the ride was on quiet country roads with minimal traffic. The minute we crossed out of Bloomingrton I could feel myself relax as we entered a shaded, tree-lined road. We could not have asked for a better weekend to go; the weather was gorgeous and surprisingly not too hot or humid for the middle of July in the Midwest. The hardest part of the trip was sleep, which was to be expected. E skipped her nap on Saturday and fell asleep on the ride home Sunday, but otherwise did great. HP had a hard time going to bed because he was so keyed up. In retrospect we should have let him stay up later with us and then all gone into the tent together. Next time. Seeing how excited HP was about every little thing. He wanted to pick out our campsite, help build the fire, go on "little hikes" (think walking around the campsite), etc. Taking an early morning walk with E down to the dock of the lake and watching the mist slowly burn off the lake as the sun came up. It was quiet and peaceful in a way I do not experience in my day-to-day life. Arriving at the campsite and knowing we got there by our own power. I remember feeling the same way when Neil and I biked from Portland to Mt. Hood after we finished graduate school. Such an empowering feeling! There is something about being in nature that I need to feel happy and whole, but do not get often enough. There were many points during the trip that I thought about Richard Louv's book The Last Child in the Woods and how valuable it is for everyone's mental health and children's development in particular to spend time in nature. 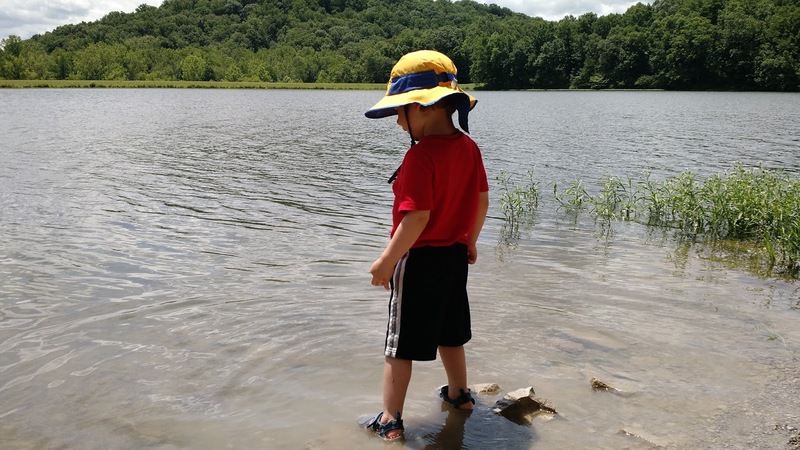 It reinforced my desire to make exploring the outdoors a priority for our family. Taking the time to be together as a family away from the city, screens, and distractions is invaluable. Overall, the trip was a huge success. It was definitely work, but a good kind of work. I take comfort in the fact that these kind of adventures are only going to get easier as the kids get older. I am already dreaming about our next bike camping adventure this fall. Crisp fall air and changing leaves + all the good things about this trip? I can hardly wait. I wrote this post way back in February, but failed to publish it. I'm doing it now as I want to remember this part of the home buying process. More on the house we did buy soon. Neil and I are in search of a new home. We are in a lease until the end of July and have been keeping our eye on new listings. Back in November we found an agent we liked. We are prepared to buy any time that we find the right place (our house in Austin sold last summer). Last Friday, I thought we had found the one. The house felt just like the one I grew up in: built in the fifties, ranch-style, family-friendly neighborhood. Nothing needing to be done ascetically to the interior---the kitchen was redone in a practical, but not showy way and had a nice gas stove, the main level had beautiful old hardwoods, the bathroom was a simple, bright, and clean, the living room featured a stone-fireplace, there was a back-entry with a mud-room type area for coats/boots, and what was originally the garage had been converted into another bedroom (we would have likely used this as a playroom for now then as the master when the kids were older). I was sold. Neil, however, was not. The problem? The detached garage. The fact that it is detached is not an issue; we are prepared to buy a house without an attached garage as so many houses in the area we are looking have either a detached or no garage at all. His issue was with its placement. The lot was oddly shaped, which mean that to meet the setback requirements the front of the garage was closer to the street than the front of the house. At first I blew it off as something ugly, but nothing more. So what if it is ugly? We can deal with ugly. But Neil's reticence remained. To him, buying that house was an endorsement of the design. A design that, to him, said that having a place to house your vehicles is more important than creating a community where people are more important that cars. 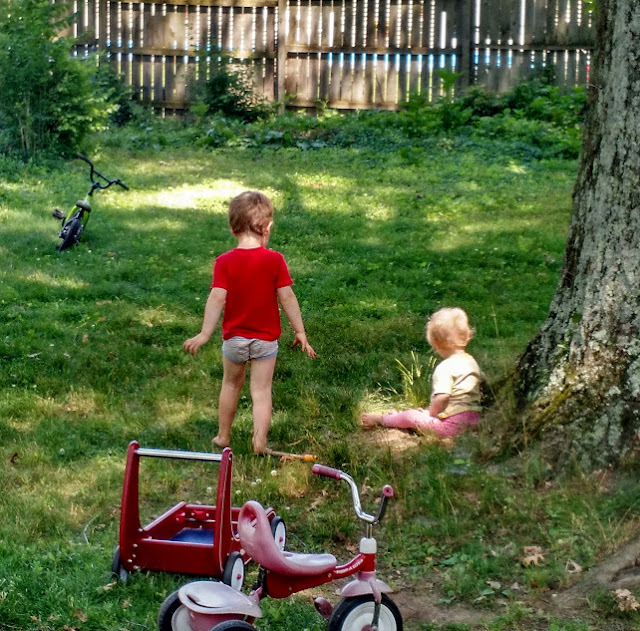 The garage is not only ugly, but it blocks off our yard from our neighbors yard, so if our kids were out playing, it would be harder for our neighbors to look out their window and see our kids (or us) out and about. Ideally, we would have torn down the garage (waste of materials and more things headed to the dump) and turned the master bedroom back into the garage. But that would cost us tens of thousands of dollars and decreased the value of the home. Not a financially sound move. I was fixated on the fact that I loved everything about the interior. Neil does not care about that, because he sees it as something we can easily change. I am less excited than he is about major renovations. We did that in Austin, and quite frankly, it was exhausting. It meant that I solo-parented on the weekends while he worked on house projects--not fun. Neil and I went back and forth about this house for two days. The whole time I was thinking, "High-five! We are such responsible adults having a respectful, thoughtful conversation about our concerns and desires." So that part was good. On Sunday we reached a place where I was fine not buying it and he would have been fine buying it. We decided to move on. The next day I found a teeny-tiny house we could move into for about $90k. Ninety thousand! The thought of having such a minimal mortgage, taxes, and insurance was so very appealing. Then I rode by and it became clear that the location that would not have worked for us. We are back to the drawing board. The whole weekend helped me see how off-track we had gotten in the search. Now I feel like we are returning to our minimalist desires--no fourth bedroom, willingness to do renovations so the house will be exactly the way we want it to be, and a cheaper neighborhood. I am excited to see what will come on the market in the next weeks and months as things pick-up and more houses get listed. Everything else is negotiable. Fingers crossed we find the right thing! Spoiler alert: the house we bought has all of those things. Well, it is just over 1500 sqft. But otherwise! A few weeks ago we took a road trip to Northern Virginia for my cousin's high school graduation. The trip was 650 miles each way. We debated taking two days to drive out and back, but were not excited about having four total travel days. We decided to just go for it and drive it the whole way in a day. According to Google, it is about a 10 hour drive with no stops. And with stops? Well, let's just say I was questioning our decision as the date approached. Turns out, there was no need to worry. The kids did great. Fantastic, really. E was done with the whole endeavor by the end, but HP was such a trooper. He just sat in the back and talked, ate snacks, and looked out the windows. He listened to part of one Sparkle Story, but otherwise was uninterested in activities. I think he really enjoys talking to us when we are not distracted or trying to accomplish other projects (you know, like cooking dinner). We don't use screens with the kids, so snacks were the key to a successful trip. I bought a whole mess of snacks they normally do not eat; some of which were healthy, like blueberries and grapes, and some of which were not, like fruit snacks and M&Ms. And I have to say, we got a lot of mileage (literally) out of those M&Ms. Of course everything did not go smoothly. Exhibit A: we got forty-five minutes out of town and then had to turn around and come back because we thought HP was getting sick (think, writhing in pain like we had never seen before). Then, upon our arrival at the house, he told us he was feeling much better and was ready to go back in the car. I still think we made the right call turning around, but a nearly two-hour delay before we even got going was not the way we wanted to start the day. The whole experience left me feeling excited for the future. That feeling was bolstered by listening to the Girl Next Door podcast on travel plans in the final hours of the drive home. 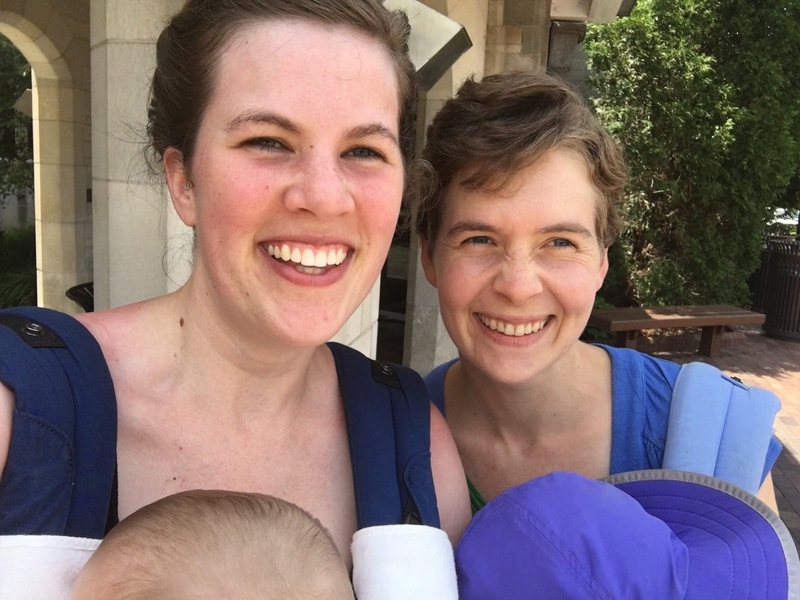 As we approached Bloomington, HP napped (a feat in and of itself), E happily chatted in the back, and I started making mental lists of all the travels we can do as a family in the years to come. Think: Acadia in Maine, Boundary Waters in Minnesota, the whole state of Alaska, going back to our old haunts (and discovering new ones) in Oregon, and the list goes on (and on). My overall takeaway from the trip was that it is starting to get easier. It's not easy (sleep was so, so terrible while we were away), but I can see that easy is just around the corner. I am impressed with what great travelers they are now and become practically giddy thinking about how much more simplified travel will be in the not-to-distant future (no diapers! no naps!). Just you wait, kids. We have so much in store for you. Since I last wrote (way back in February) we found, bought, and moved into a new house. That process consumed much of my time and mental energy this spring. This house is the ninth house Neil and I have lived in since moving in together in 2008. It feels so good to be somewhere that we see ourselves staying for years to come. Finish unpacking the house. All of the stuff we use every day is unpacked (kitchen, bathrooms, bedrooms), but we still need to find a home for everything that was in the garage and the guest room at the old house. I also want to get what little art we have hung on the walls. Write a little every day, even if only for fifteen minutes. I'd like to get back in the habit and need to figure out what time of day works best. Early mornings are hard (see below) since I am on parenting duty starting in the five o'clock hour. Being productive in the evenings never seems to work for me as all I want to do at the end of the day is read a book or chat with Neil. HP rests for an hour every day, so using a chunk of that time is likely my best bet. Be in bed by 8:30 with lights out by 9. I know that sounds insanely early to most people, but it is what needs to happen for me to be a fully functioning human all day long. E is up by 5:15 or 5:30 every morning. I am fine waking up that early, but start to crash in the late afternoon if I haven't gotten enough sleep. Research and possibly apply for a part-time job. There is a position I saw advertised that looks like it could be a great fit in terms of my interests and skills. I need to find out more about the exact time commitment as the posting was vague, then decide if I want to move forward. June, I am already loving your long summer days; I look forward to a great month together. Reading Zero Waste Home and Plastic-Free. We have made some major changes as a result of those books, which I will write more about soon. They were challenging to read, but too important not to. Listening to Susan Cain's podcast Quiet. I have already raved about her book by the same name on multiple occasions. Neil and I are both introverts raising two introverts. I love hearing someone speak intelligently about what that means and who do not treat it as a handicap, but an asset. Her podcast specifically focuses on raising quiet kids. It has made me even more thankful for HP's preschool teachers who have accepted him exactly as he is. Culturing yogurt, kefir, and kombucha. Jury is still out on how I feel about kefir. Watching the final season of Parks and Rec with Neil. It is rare that we find a show that we both enjoy and I will be sad when we reach the end. Anyone have any recommendations for what we should watch next? Reveling in the fact that on Sunday night both my children slept through the night. 6:45 to 6:15 for the youngest and 7:15 to 6:30 for the oldest. This may be only the fifth time that has happened. Ever. And both sleeping past 6 a.m.? That, my friends, is living the dream. Bursting with pride at HP's recent developmental leaps. He has hit his stride in preschool and I am just so dang proud of him. Cooking with my new Instant Pot. I was hesitant to buy a large kitchen appliance when we are trying to reduce the amount of stuff we own. And, to be honest, the way we were cooking before was working, so why change? I was finally sold based its versatility: it is a yogurt maker, slow-cooker, and pressure cooker all-in-one. I am still figuring out all of its uses and how to make the most of it. So far we've made beans, yogurt, red lentil curry, and butternut-ginger soup. Surprised at how easily E transitioned from the pack-n-play back to the floor bed. We made the decision to try it on a whim this weekend and it's been relatively smooth sailing since. Some background: HP has always used a floor bed, and E started it one, but when we went through the moves and traveling last summer we put her to the pack-n-play so she would have a constant amid all the changes. We tried to switch back in late summer, but it was disaster. Take two: success! Excited for my mom's visit this weekend. Feeling nostalgic for the newborn days. One of my very best friends had her baby over the weekend, as did two acquaintances. Seeing all of the newborn pics has taken me back to those early days with my children. I am so happy to be where we are as a family, but a days-old baby? Be still, my heart. We are more than a month into 2016, but I feel as though I am only just now finding my footing. January was rough going at our house. Stomach bug, freezing temps (I took E to a well-check in "feels like -10" degree temps), and then all four of us being struck down by another illness that just wouldn't quit. I know it will still be wintry and cold for weeks to come, but it feels like a victory just to have made it through January. February, welcome! When I tried to think of a word or intention for 2016, I had trouble narrowing it down between create and connect. I have taken big steps back from social media this year so I can better focus on the things I love. A logical next step would be to prioritize connecting to friends and family through more personal forms of communication. But as I continued to contemplate the year ahead, I decided I didn't want to put that pressure on myself. 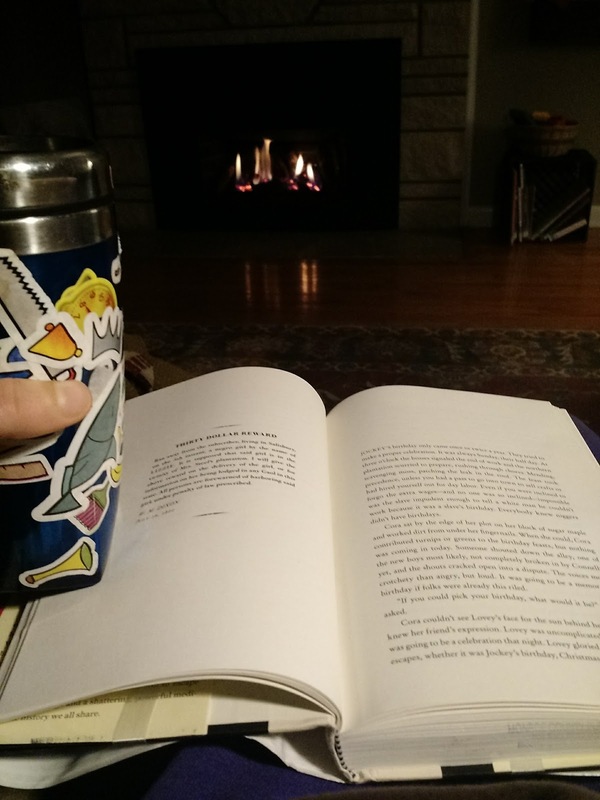 As an introvert who spends all day "on" with my children, when bedtime rolls around I need to disappear into a book and have some time with no social input. I have still set goals for myself to reach out to close friends more often via email, texts, and phone calls, but I don't want it to be the overarching focus of my year. Instead, I decided to turn my attention toward something I used to do all the time--create. My creative projects have fallen by the wayside since having children. I used to play the piano, collage, write, knit, etc. Now? Almost never. I want to eventually create art for my home by putting quotes on canvas (similar to this). I know it will take a lot of practice to get to the point where I want to showcase my work in our home, and I'm ready to begin. I would like to write more for the blog, but also just for myself. I used to write at the time as a way to sort through my thoughts, but I haven't made time for that kind of personal writing in years. I miss it. This one won't happen until after we buy a house and either (1) bring my childhood piano to our new house or (2) buy a piano off Craigslist. I am not sure which we will do, but once we have one I want set up a plan to play regularly--maybe even taking lessons. This will be a project for the second half of they year as I don't want to figure out the logistics of moving and tuning a piano twice. I used to make collages for myself and friends on a somewhat regular basis. I find the process incredibly soothing and the end result satisfying. At times, it feels a bit silly, but it is the kind of silliness that I love. Back when I was trying to woo Neil I made him a collage for his birthday. Less than two months later, we were dating. Do I need further proof of the power of the mighty collage? (1) Naps are long gone for my eldest, but HP is once again resting in his room for an hour every afternoon. There was a dark period of our lives where that rest was not happening for a variety of uninteresting reasons, but it is over--all the rejoicing! (2) E has decided to tolerate the childcare at our local Y (!). Now on the two mornings HP is in preschool, I can drop her off and use the time read, write, or craft. (3) The weekends already feel full with family time and procuring and prepping food for the upcoming week, but I know I could carve out some time for myself if Neil and I planned it in advance. I am excited to make more time for creativity after years of neglecting that part of my life. 2016, let's do this! Gawande's latest book may be the most thought-provoking book on my list. Immediately after I read it I had Neil do the same so we could discuss. It explores the state of eldercare in the country--what we are doing right, what we are doing wrong, why it is the way it is, and possible solutions. The most interesting question to me was how to balance what children want for their aging parents (safety) and what the parents want for themselves (freedom and autonomy). It made me think about how I want to age and die in a society that prefers not to discuss those topics. This one is the third book of four in the Raven Boys series (the fourth comes out this spring!). I read all three in early 2016, and it is a rare series where each book is better than the last. It is YA fantasy fiction, so if that is not your jam, then you should skip this series, but I thoroughly enjoyed it. Funky, interesting characters, an unusual plot premise, and quality writing. It is no surprise that this book one the Pulitzer as I found myself savoring every word as I read it. It is a WWII story, but so much more. Who is good? Who is evil? How would we respond to the kinds of moral questions that defined that era? It is depressing, but in a way that connects us more deeply to humanity. Beautiful, beautiful prose that elegantly wove together multiple story lines. This one was a book club read for two different book clubs (one in Austin and one in Bloomington), and with good reason. It was well-written and provided plenty of fodder for discussion. The premise: the world's infrastructure collapses after a flu epidemic kills off most of the population--what does civilization look like twenty years later? In reading the book, it became clear to me that I would not be a survivor; I do not have the instincts and quick wits required. Neil on the other hand would make it through unscathed. Genova tells the story of fictional Alice, a woman with early-onset Alzheimer's. I have thought about Alzheimer's from the perspective of loved ones before, but never from the point of view of the person experiencing it--at least not as deeply and intimately as I did through this book. Heartbreaking, but worth the read. I have enjoyed all of Rubin's books, but this one more than most. It is a quick read with many useful tidbits, strategies, and anecdotes on how to make the type of changes you want in your life. I love that she doesn't have a "one-size fits all" approach, but emphasizes knowing yourself and what strategies would work best for you. I also recommend her podcast, Happier. Oh, parenting books, how I both love and hate you. But this is one of the best. So much of it is in line with RIE philosophy (see Janet Lansbury's site for more on RIE). Reading the book was just what I needed after the move to realign my actions with my values in the parenting realm. I think it is one that I will reread every few years to remind myself of the kind of parent I want to be. I likely never would have read this book if it had not been the pick for my online book club. Abby's pick was such a pleasant surprise. It explored the themes of religion, tradition, and feminism in an unnamed Middle Eastern country from the perspective of a teenage hacker. You have to be willing to suspend disbelief and commit to the story, but if you do, you will not be sorry. Friends, if you have not read this book, run to your nearest library and remedy that situation immediately. It is without question the best book that I read in 2015. Every person I know that has read it has also loved it. The book explores the idea of virtual reality and life lived online. Are we more of our true selves online? Or less? How well do we know people virtually? It is filled with 80s trivia and references, so I think it would be most fully appreciated by a video-game lover born in he early 70s, but I had no problem loving it with limited cultural knowledge of the era. What else can I say? Interesting, diverse characters, beautiful storytelling--I couldn't put it down. This is the book that had me talking about microbes and poop for weeks on end. The book itself was really well done for a health/science book. The authors were upfront about what we do know about the microbiome and what we don't. They clearly explained the limitations of the research, while still stating what we can do with the knowledge that is available. After reading it I was inspired to start brewing my own kombucha (again--we did this before HP was born but then haven't since), making our own yogurt, and culturing kefir at home. Also, lots of fiber. For my birthday I want to get my poop tested by the American Gut Project. Happy birthday to me! For more, see my favorite books from 2012, 2013, and 2014. Neil and I both turned thirty. Neil applied for and got a job in Bloomington, Indiana. We celebrated six years of marriage. We moved across the country. Neil studied for (and passed!!) the Professional Engineering (PE) Exam. Raising an infant and a three-year old is hard work. I frequently needed to remember my words for the year (this moment), take a deep breath, and embrace what was right in front of me: exhaustion, joy, craziness, frustration, sweetness, and chaos--I experienced them all, often in the same day or hour. Having a baby again was both a challenge and a joy. So many things were easier the second time around (we know what we're doing! ), and also harder (there are two of them!). We know that E is our last child, so were able to appreciate her in all of her lovely infant-ness. One of the biggest highlights of the year was watching her and HP interact as she has grown. As much as I loved her infancy, I am thrilled to be leaving the baby days behind and moving into the next phase of life as a family of four. At the start of the year, I had no idea that our days in Austin were so numbered. Early in the year we decided that Neil would start actively looking for jobs elsewhere (here are some of our reasons why), but we were very particular about the type of place we wanted to move and did not know when the right thing would come along. But here we are, and happily so. Neil taking the PE dominated the last half of our year. From August until the end of October he was studying in every spare moment. I wish that statement was an exaggeration, but it's not. Every night once the kids were in bed he would pull out his books and study. Same thing on the weekends. I ended up picking up the slack around the house, taking over dish duty (usually his responsibility), and doing more parenting on the weekend so he could study. Really, the whole year felt like a lot of solo-parenting. In Austin I took on more childcare because he was applying for jobs, then applying for the PE, then fixing up the house to sell. Once we moved, he went right into studying for the PE. It is only in the last two months of the year that we've found any kind of new normal. I am looking forward to continuing to find a better balance in the evenings and on the weekends in the upcoming year. So very, very little sleep was had in 2015. A week or so ago both kids slept through the night and I turned to Neil and asked, "Has that ever happened before?!" I know it has, but I can count the number of times on one hand. And I wouldn't need all the fingers. E has been our early riser (oh, hello 4:45 a.m., how are you? ), and HP has been waking up multiple times as night. Sigh. I do see a light at the end of the tunnel. 2016, may you be filled with many hours and nights of uninterrupted sleep. There were many times this year where it felt like we were waiting to get through "one more thing" before life could return to normal. Applying for jobs, packing up the house, applying for the PE, moving, unpacking the house, taking the PE... And now we've arrived. Thank goodness. Despite all the craziness, the lack of sleep, the big life changes, and the never-ending needs of two small children, things have felt good. Sometimes in the evenings I will just look at Neil and say, "Isn't life good?" We have two amazing kids, we have found the place where we want to put down roots, we have a supportive community of friends and family... Quite simply--we are happy. So if 2015 brought that much happiness and joy, I can only imagine how amazing 2016 will be. Right now, it looks shiny, new, and full of possibilities.